The softest and coziest tees, leggings, jackets, and more that you honestly need in your life. 1. A pair of deep pile, fleece-lined leggings so soft, you'll feel like you might be wearing actual clouds. Get them from Amazon for $10.99 (available in 10 colors and styles). 2. A textured velvet dress that'll look equally fabulous over leggings, tights, or over-the-knee boots for softness + warmth. Get it from Amazon for $22.55+ (available in sizes S–XL and four colors). 3. A open-back sweatshirt top for those occasions you're ~going out~ with friends, but don't want to sacrifice feeling cozy. Get it from Walmart for $29.50 (available in sizes XS–3X and five colors). 4. A Goldilocks-approved v-neck tee with the perfect drape and a super soft modal and spandex blend the brand calls "absurdly soft." Yes please! Get it from Amazon for $12+ (available in sizes S–XL and in black). 5. A pair of ribbed PJ leggings you just might spend the whole weekend in. Get them from Torrid for $29.98 (originally $36.90; available in sizes M–6X). 6. An oversized turtleneck dress you (like the turtle himself) will want to bring with you wherever you go. It has pockets and the perfect slouchy fit for effortless style. Get it from Amazon for $39.99+ (available in sizes S–XL and four colors). 7. Impossibly soft lounge shorts, because spring is coming, and wearing shorts under a blanket is way cozier than just wearing PJ pants. These have over 1,500 five-star reviews alone. I know. Get it from Amazon for $14.99+ (available in sizes XS–2X and in two colors). 8. A draped jumpsuit (with pockets!) for a look as elegant as an LBD...but actually feels like you're wearing sweats. Get it from Modcloth for $60 (available in sizes S–3X). 9. A monogrammed sherpa fleece pullover everyone will want to steal from you — but no one can, because DUH, it has your name on it! You can customize it with one of seven monogram styles and 30 embroidery thread colors. Comfy factor: "LOVE THIS SHERPA!!! The monogram is perfect! This is SO warm! I love it! Exactly what I was looking for and delivered so quickly! I highly recommended it!" —Hope F.
Get it from Monogram Madness 12 on Etsy for $29.99 (available in sizes S/M–2X/3X and in three colors). 10. A soft and durable plaid flannel shirt perfect for layering with any outfit. Get it from Amazon for $16.97+ (available in sizes S–2XT and nine colors). 11. A faux fur hoodie jacket that only *looks* expensive with its plush exterior and silky interior. It's oversized, so feel free to size down! Get it from Urban Outfitters for $49.99 (originally $99 available in sizes XS–XL and four colors). 12. A five-pack of plush socks to toast (but not overheat) your tootsies. Comfy factor: "I am a fuzzy sock lover!!! This pack of socks is fabulous. They are so soft and comfortable. I normally can't sleep with socks on my feet, but I can with these. I love them." —Stacy L.
Get a pack of five from Amazon for $20.99 (available in 19 color and pattern combos). 13. An oversized teddy coat, because you deserve to stay up to date on the latest trends AND stay warm, even on the chilliest false spring days. Get it from Amazon for $31.99 (available in sizes S–3XL and in seven colors). 14. An enormous plaid blanket scarf you can tie SO many ways for a different look every time you wear it. Get it from Amazon for $7.99+ (available in 19 colors). 15. A super-soft sweatshirt top featuring lace-up sides and a tailored cut for an upgraded version of your standard college hoodie. Get them from American Eagle for $27.96 (originally $39.95; available in sizes XXS–XXL and three colors). Get them from Old Navy for $34.99 (available in sizes 0–20 regular, tall, and petite). Check out all the available Rockstar Jegging washes and styles here. 17. Investment-worthy Spanx faux leather leggings to provide all-day comfort and effortless style. Pop a sweater on over these, add your favorite booties, sneakers, or heels, and head right out the door. Outfit complete! Comfy factor: "Aside from what I work out in, these might be the most comfortable and flattering leggings I own. They can easily be dressed up with a blouse and low heels or used for a more casual look with a tunic or long sweater." —Nicole V.
Get them from Anthropologie (available in sizes XS–XL and in two colors) or Nordstrom for $98 (available in sizes XS–XL). Looking for something a little less splurge-y? Reviewers love these faux leather leggings on Amazon — they're $22.99 and come in sizes XS–4X! 18. A sherpa-lined hoodie that's basically a game changer for anyone who's allllllways cold. You best buy two, otherwise your S.O. will be stealing this on the daily. Get it from Amazon for $39.99 (available in sizes XS–XXL and six colors). 19. A velvet duster with a ruffled hem so you can sweep dramatically in and out of rooms — without the restricted-arm feeling you get with regular jackets. Comfy factor: "I wore this to several different Christmas parties and received so many compliments. So soft and comfortable. I found myself touching myself a lot to feel the velvet. I would buy this in every color if I could justify the need." —Kris F.
Get it from Amazon for $25.99+ (available in sizes S–XL and in 12 colors). 20. A velour crop top and shorts set that'll prove that lounging in style *and* comfort is oh-so possible. And if your friends call to hang at the last minute? You don't even need to change. Get it from Amazon for $9.99+ (available in sizes XS-XL and three colors). 21. A ribbed swing dress in a super-soft knit you'll want to wear at least three days a week. Just check out that cool open back detail! Comfy factor: "It's really comfortable! Its a little shorter than expected, but it is comfortable and I got a lot of compliments on the back." —Sydney R.
Get it from Forever 21 for $12.90 (available in sizes S–L and three colors). 22. A Calvin Klein bralette and boyshort set definitely comfortable enough to sleep in. Get it from Amazon for $33.41+ (available in sizes XS–XL and in five colors). If you're looking for *just* the bralette, get one from Amazon for $15.80+ (available in tooons of colors and patterns). 23. A cool sweatshirt with an asymmetrical side zipper that gives a moto jacket effect. Get it from ModCloth for $59 (available in sizes XS–1X). 24. A pair of plush boot socks emblazoned with cute critters to keep you company. Get them from Amazon for $9.99 (also available in three patterns). 25. ~Feel cool~ high-waisted leggings designed with moisture-wicking fabric, a cool colorblock accent, and a POCKET for comfort and convenience. Get it from American Eagle for $19.98 (originally $49.95; available in sizes XXS–XXL). 26. A terry and modal cotton blend hoodie dress for a one-and-done outfit your inner lazy fashionista will love. Get it from Amazon for $30 (available in sizes 1X–7X and four colors). 27. An oversized sweater in a soft thermal knit that's not itchy at all. Get it from Urban Outfitters for $34 (originally $44; available in sizes XS–L and six colors). 28. A deceptively warm zip-up fleece with patch pockets that are both stylish and convenient. Get it from Amazon for $49.80+ (available in sizes XS–XL and four colors). 29. Buttery-soft Adidas-esque striped leggings...but for way less money than actual Adidas. Get them from Amazon for $9.95+ (available in sizes S/M–L/XL and 40 colors, both with stripes and without). 30. A varsity stripe mini that combines the comfort of sweatpants with the best part of wearing a dress: not having to put an outfit together. Get it from Express for $40.99 (originally $59.90; available in sizes XS–XL). 31. A pair of athletic leggings you'll want to wear to far more than just the gym — to the office, out shopping, to a brunch buffet, lounging at home all day...the list goes on. Get it from Target for $24.95 (available in sizes XS–XXL short, regular, and long and in black and burgundy). Btw, I am low-key obsessed with these. Check out my full Target Champion leggings review for all the info! 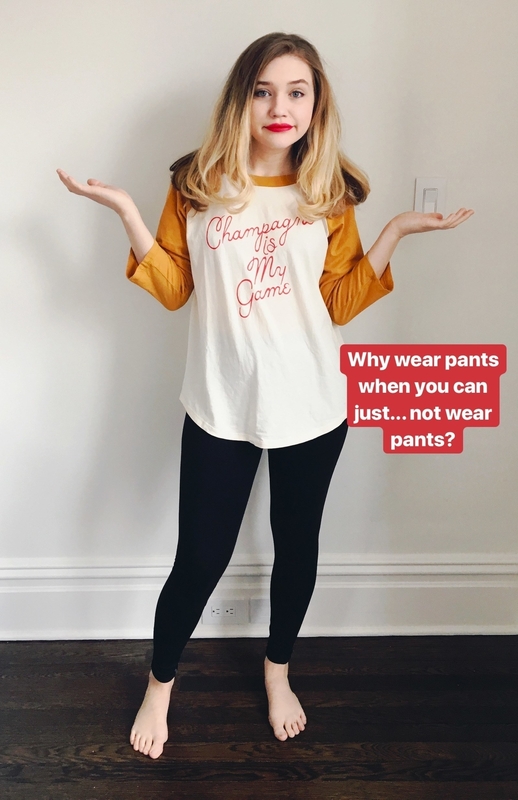 This won best mid-priced leggings on BuzzFeed Reviews! 32. A knit moto jacket that's even better than a leather jacket. Why? You get all the cool factor, but at a fraction of the price — while being able to move your arms! Get it from Nordstrom for $98 (available in sizes XS–XXL). 33. A ruffled cold shoulder dress made out of a sweatshirtlike fleece to keep you warm. Good luck not reaching for this every single day. Get it from Lane Bryant for $27.49 (originally $54.99; available in sizes 10/12–26/28). 34. Stylish joggers with all the comfort of sweatpants, but that are cute enough to inspire a fashion blogger–style Instagram while running errands. 35. A pair of pull-on pants so you can bring the D-R-A-M-A and vintage-y vibes without ever feeling constrained or uncomfy. And yes they DO have pockets! Get them from J. Crew for $128 (available in sizes 00–16 and three colors). Get it from Amazon for $29.99 (available in one size (claims to fit sizes 0–10) and three colors). 37. A fleecy dress (with pockets!) to combine the comfort of sweatpants with the best part of wearing a dress: not having to put an outfit together. Get it from Amazon for $16.99+ (available in sizes S–XXL and 26 colors, both crew- and v-neck). Want more? Check out our favorite online clothing stores for all your shopping needs, plus the best places to buy used clothing online and the best clothing stores for petite sizes. Still not satisfied? Check out all of our clothing content for even more.